Are you still using a bucket of soap and a sponge to wash your car? That is so old school and until recently I was in same boat. That was until a friend of mine suggested I buy the best snow foam gun. I thought he was taking the p*ss and said there’s no snow in Melbourne. After a quick link to a Youtube video I knew I had to get my hands on one. This ingenious device connects to either your hose pipe or pressure washer depending on the model and blankets your car or motorcycle in think foamy bubbles in seconds. Make washing your pride and joy a super fun experience without paying $10-$25 at your local car wash. For the price of one or two washes you’ll be able to clean your car like a pro every weekend for FREE. There are many different brands that are simply private label brands snow foam guns. It can be difficult to find the original manufacturers to exercise caution when buying online. It’s the most popular snow foam gun on the market and suits most brand name cold water electric pressure washers. You can even choose the adaptor for a perfect fit. Brands include Gerni, Karcher K, Lavor, Stihl and Nilfisk brands. This high powered device offers a maximum pressure of 3300PSI/220Bar and water up to 60 degrees. A 1L 32oz bottle is included for long periods of use and the nozzle is fully adjustable for different spray widths and flow rates. Compared to the expensive models featured on Youtube channels this is one of the cheapest snow foam cannons on the market. Voted #1 Best Snow Foam Gun Australia. 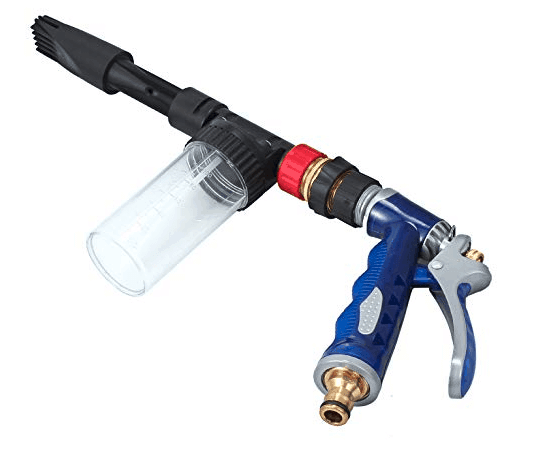 The Nuzamas is a unique foam cleaning gun with 900ml capacity that works with nearly any garden hose using an easy universal connection. A unique 2 in 1 function allows you to spray foam or water depending on whether you’re foaming or rinsing. The Nuzamas creates thick, clinging foam every time and with the adjustable ratio dial you can choose six different sprays. The power output is not as powerful as the XZT as you’re using a standard garden hose rather than a power washer but you can upgrade to the Nuzamas high pressure gun if you’d like (see #3). During testing the flow rate was 5.5L per minute from a distance of up to 8 metres. The device is lightweight and easy to clean and maintain. If you’re looking for a high pressure foam gun without needing a power washer you’d be foolish to overlook the Nuzamas. If you’re looking to take the Nuzamas but want to buy the higher pressure gun that fits on standard electric washers then you’ll need this one. 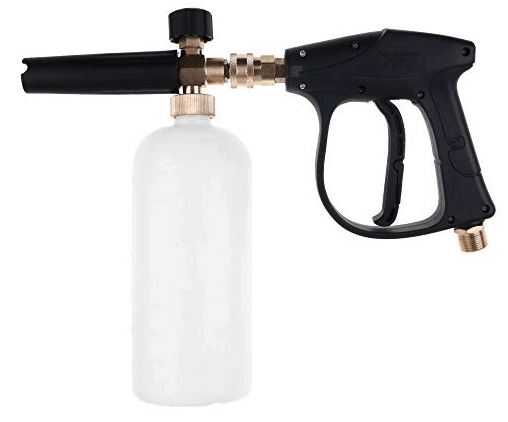 It features a large 1L snow foam bottle and 5 different spray nozzle tips for 0,15,25,40 and 65 degrees for every possible use case. Combining high pressure water flow and mixed with detergent and air you’ll have thick clinging foam every time. The design and build quality would suit professionals and washing enthusiasts looking for the best in the business. Boy does this snow foam gun look awesome. Featuring a slighty smaller 100ml capacity it works with most garden hoses and offers the ability to spray both water and foam. 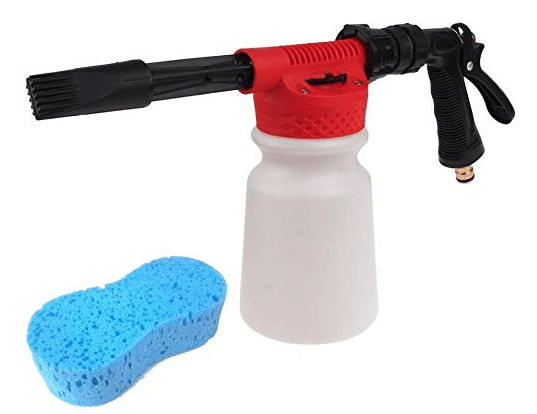 An adjustable ratio dial mixes and sprays 6 ratios of foam and is suitable for small family cars, motorcycles and other household devices that need a clean. If you’re cleaning a large car, boat etc I’d opt for something larger. It’s perfect for storing or carrying around due to it’s small and portable design. It’s pretty robust and sturdy given it’s low price. 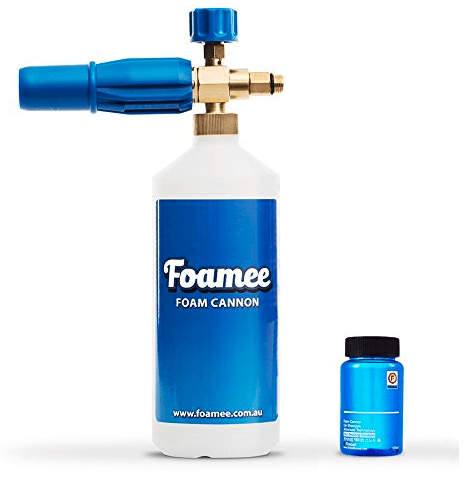 Last on our list of the best snow foam guns is the Foamee which looks sleek and is manufactured locally and sold in many stores nationwide. 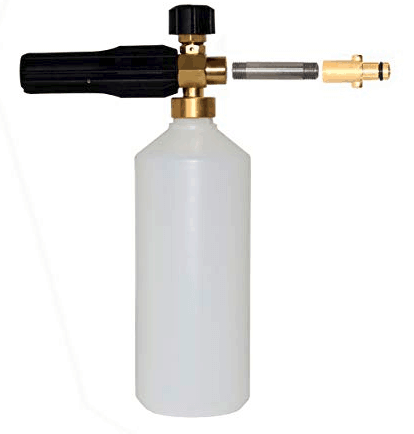 Offering a heavy duty solid brass head and wide angle or pin point spray nozzle it’s ready to go for washing small, medium and large vehicles. The device connects to standard Australian brands pressure washers and Foamee offers adapters for any brand in the domestic market. You’ll also get a free sample of their famous Foamee detergent to get washing right away. A one year warranty and rust proof brass head is some of their main selling points. How To Use A Snow Foam Gun? Simply add 100ml of your chosen detergent diluted with water into your snow foam gun hopper. Then attach it to your garden hose or power washer (you may need an adapter), adjust the dial and shoot your foam. Now you know the best snow foam gun Australia, why not checkout our other guides, reviews and product knowledge.